Ola, I have been wearing this little number for the past couple of days…..but today I sat down and took the photos. The Boho Baby Dress from DCNY is exactly what I was looking for to go with this magnificent Cyanne style from Truth. I know I am in love with Retro baby, and the new Sophia pre-release with pale lips just called out…wear me! Along with a few of my favorites things, I present the nights look, I hope you like it! As much as I want to blog more right now I needs sleep……….but I am working on a few photos already for tomorrow! If only there was more time in the day yes? Have a wonderful evening and I will………………. But onto the goodness, Belleza was rocking the sales out on a few different skins as part of Skin Addiction, make sure to check them out, but I was only to happy to see Wynter on sale for Fifty Linden Friday 🙂 Wynter is to entirely kewt with her little cold like nose and color….LOVE! I have been wanting to wear this pretty Hoodie from Zenith from FAIR that when I saw the kewtest ever Nele Hat w/Hair from Emotions today at the Euphoria Black Friday sale I knew what the plan was. Now Hucci has quite a few new releases that are on sale today, the Tunxi Boots are on sale for just 75L and come in Sand Snake and a darker color….hurry a steal at this price! I also picked up a few rings there as well, the Lighter Ring is fantastic and comes in a few colors but I adore the Rose Gold. Je Suis is having a sale to, I always love getting into this store, this color change Classique Scarf is perfect but make sure to check out the rest of the store! I also picked up the most wicked poses from Di’s Opera at the Euphoria Sale, do not miss these there are 2 sets out for 50L and a must have, The Euphoria Sale and Skin Addiction are group only but just join when you get there so you can roam and grab all the wonderful items out for today. I have also been checking Seraphim all day for new sales to come up, they have a wonderful long list. Ok I am out for a bit, Have a wonderful shopping day (or night) and I will………………. Oh hai! After a total exhausting weekend, child sick…. a little blog revamp…a Christmas Party…….and the odd tad alcohol intake, oh and the crazy radio station I listen to playing Christmas Songs all day I feel like I am in a weird time warp lolz. But I still managed to get a bit of shopping done at 6 am this morning before I went to bed!! I know most have seen the new Sweetwater Room from Cheeky Pea out for Collabor88 this round, but I (being the ever so observant blogger) just tuned in earlier and o m g I love it! The shadow play alone on this open latticed ceiling is fabulous, then add in the gorgeous bed and all the extras it comes with and I am one happy little Evi! If you haven’t yet please teleport to the demo at C88 and look for yourself! Now being an avid PixelDoll fan for many a year now and for some reason thinking it was closed, walking around the Unhinged Festival and seeing the most magnificent mesh Vigne Dress with cut out back, I was to say the least very pleased. The Vigne comes with many options of sleeves as well as five different types of skirts and the fabulous Muses jewelry (which come in both silver or gold)……..ugh divine is all I can say. FAIR has regrouped for this round and wow U&R Dogs has this beautiful little Mother Goose Watch Ring and Nail set, both having the option to turn off so I am only wearing the ring which by touch has six different styles to choose from some of which include this most adorable little birdy….Yum! I also picked up the most fabulous little Mahogany Curio Table from Trompe Loeil there as well, along with the poses I am using from one of my favorite pose stores Di’s Opera. I just love the way these poses flow from one to another and they are always just so elegant. Speaking about elegance, I had a chance to travel Around the World…The Ego Co. event and there are many beautiful things to be had in all areas….but the very first thing I picked up was the new Sophia skin from [PXL]……she is an absolute must have if you are a skin…..um……freak (lets go with) like me 😉 Sophia is perfect in every way….Classy and elegant with or with out the light dusting of freckles that I so adore. She can be bought in single lipstick versions or a fatpack of all four in either Sunkissed or Olive Tone…..love, Love LOVE her! Ok I must get my kidlet to bed and maybe catch some zzzzz’s myself lol, but I shall…………………..
Is a pretty little blue dress! Ola, yes again so soon! But the Hottie Cooterati Cinema Event ends soon and I really wanted to post this beauty of a Liason Chemise dress from Volstead, a brand new store to me that I rather adore! Events like the Cinema engage all of us to look around, find new designers that we didn’t know before. I love that all the theaters had themes, but without fabulous events like these we may have been missing out on some really rather fantastic clothing! The amazing Mint Hair from Analog Dog screamed at me to be worn, pulled together with some fantabulous new jewelry and this amazing new Donna skin from Mojo Skins, I went for the Peach tone this time and I am in lust with this soft and lovely skin. Scrumptious!!!! Ok last one for this evening. I have said it many times, but I must say it again, I love mesh, I love the way it moves when you do. This fabulous mesh Gold Butterfly mesh dress from Volstead comes with two pieces, the regular dress and a mesh overlay top, it is very lovely indeed and made a very good impression as I will be watching Volstead (a new store to me) and waiting for new releases! 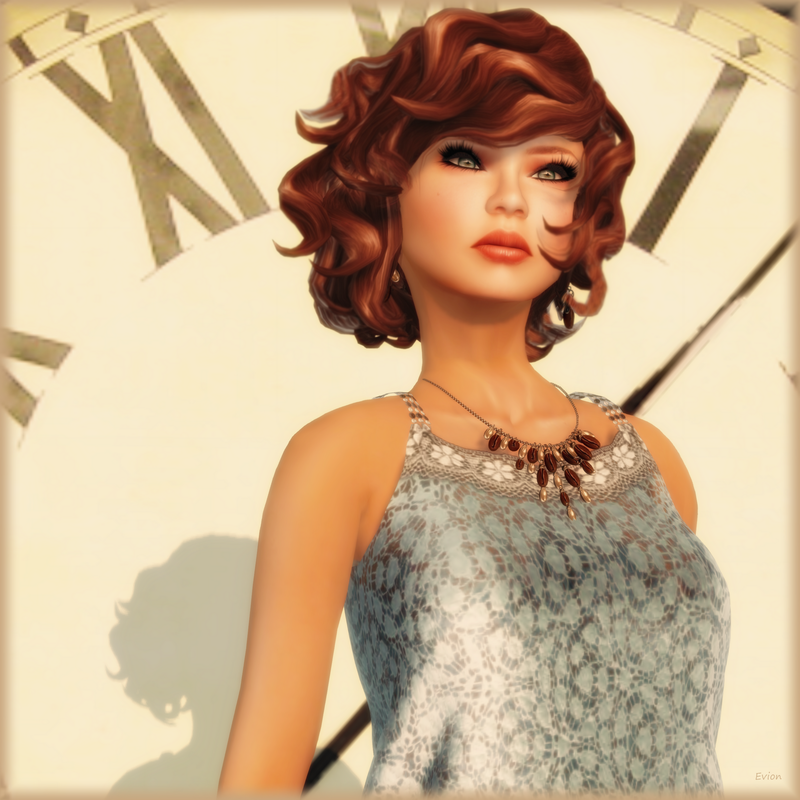 The Background Chairs and Clock and Vase are a new release from Baffle and available@Fair along with this amazing Coffee Been Necklace and bracelet from Izzie’s. The kewtest ever Flat Telephone is from % Percent Furniture and when you touch it, it rings! There are many different colors to choose from, and if you are in the group, there is a fabulous Telephone and shelf for the Gift. Ok I am off to sleep finally, but I have a whole mess of Halloween posts to do tomorrow, so I will……………. 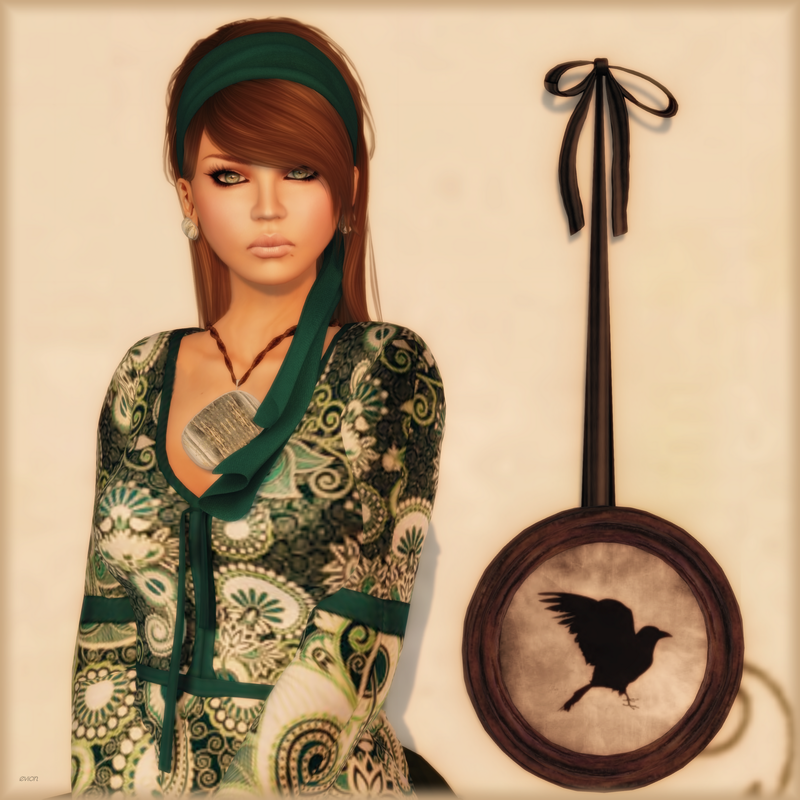 Ola, yes Evi has made it through five whole years of sl! Five years ago today I was watching CSI: New York (ok which I never watch) lol and Venus showed me the way in. Now I admit when I first logged into second life and threw myself off orientation island within five whole minutes, I thought what a waste lol. I didn’t know how to open a box, I could not understand how to make my hair long and why I was walking so funny! Thank gawd I ran into some really nice people who introduced me to Lucky Chairs and walked me through what I needed to know, a very daunting task! Well here is hoping that I will be bopping in and out of sl for another five years………..or someone hands me a cool couple million rl dollars and I will continue on there lol, either way ‘Happy Rez Day Evi” You deserve it for sticking around and putting up with your typist for so damn long!